Click on the old service station to see our original post with this old store and station, plus a few more aged structures. This week we are sending you back to New Edinburg, Arkansas in December 2010 to see an old store and filling station, and a few of it’s well-aged neighbors in what was once a bustling community. New Edinburg is still a nice place. It’s just a lot quieter now. I got lucky. A friend who just happens to be the local historian gave me the two-bit tour laced with tidbits of inside information as we traipsed through the town. Winter and fall were off schedule then as you can tell with the still fully-leaved trees in some of the pictures. Click here to see our original post. Be sure and click on the Weekly Grist Gallery link at the bottom of the original post page. It will send you to a gallery with detailed pictures of the old store and some of its neighbors. Our original target for the trip was the Clement Hotel, a recently restored (at the time) two-story frame structure. The owners did most of the work and they did it well. You can see the old hotel and more on the Photo of the Week page at Corndancer dot com. August 2011. The heat is stifling as has been for weeks. Click on the picture for the original post. The year 2011 was as dry as a powder house here in LA (lower Arkansas). 2012 was a slight improvement, but nothing to write home about. Our favorite ponds are still below normal. We have high hopes for 2013. In the meantime, this week we are sending you back to our post of August 8, 2011, at the one of the several “heights” of our misery. After I did the 2011 “dry” shots, of all things, we finally got a decent rain. Though the rain was as welcome as spring after winter and gave us some relief, it was unfortunately no where decent enough to fulfill our fondest dreams and bring us back to normal. Click the leaves to see the wet version of this story. 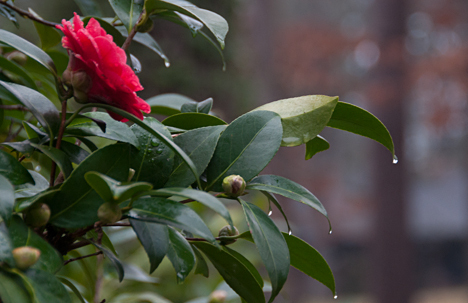 What the rain storm did do was afford the opportunity to photograph the results of rain. So that week I wrote about opposing forces on the Corndancer and Weekly Grist. One wet. One dry. See the wet version on the August 08, 2011 Corndancer Photo of the Week page. See all of our wet/dry pictures in our Weekly Grist gallery. You’ll see the pictures in our post plus several others that are not published elsewhere. 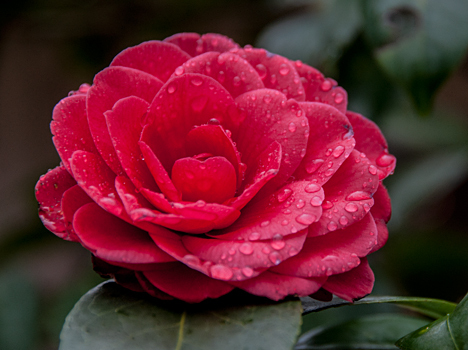 Red camellia bloom with rain drops. 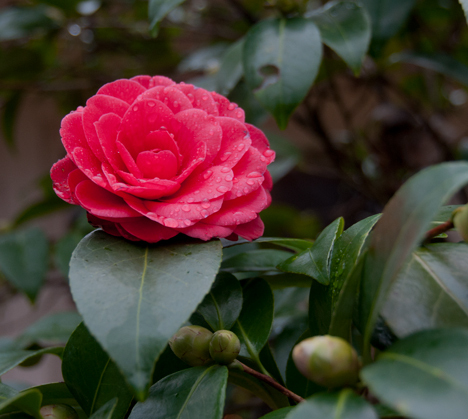 Click here to see our original camellia story and pictures from 2009. Found on Hot Spring County road 61: Locust Hill (that’s what it says on the sign). Locust hill looks more like it should be in New Mexico than central Arkansas. I found it after making a decision to bear left at a fork in the road. Had I gone right, I, and by extension, you, would have missed it. Thank goodness for Divine intervention. 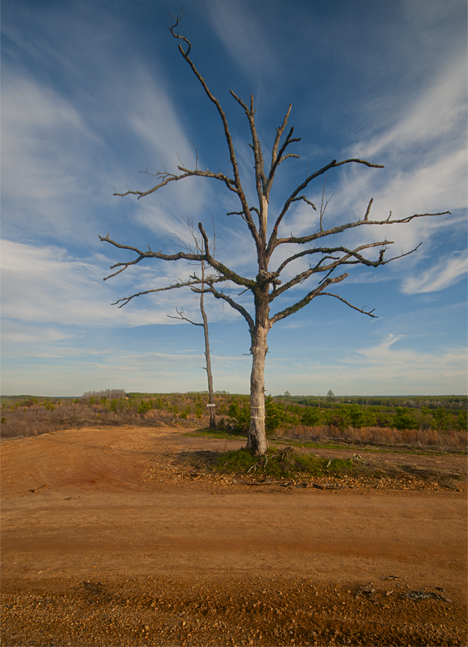 After a commercial shoot in Hot Springs, Arkansas, on the trip back home, I took a deliberate detour down a county road I have been eying for a while. The road, Hot Spring County Road 61 came to a split after a few miles and it was decision time. Something told me to take the left fork. Turns out, that left veer was the right decision. Locust Hill was not the first great find on County Road 61. Before it came a bridge over Huskey Creek, a nice stream laid bare by winter and looking good for pictures. See Huskey Creek on the Photo of the Week Page at Corndancer dot-com as a great example of what you can see in the winter that you can’t in warmer months. We’ll wait here while you look. 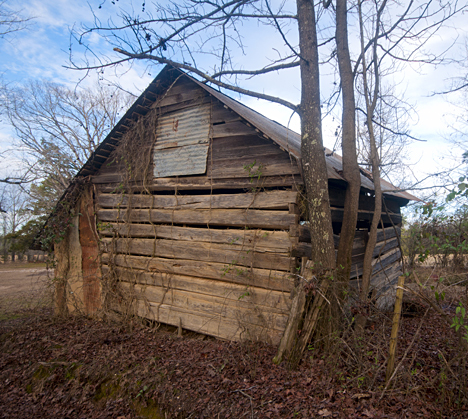 This old log cabin, barn or whatever it may be was another great find on Hot Spring County Road 61. You can easily see hand tool marks left by hand hewing the logs. No doubt, the logs were from trees felled not far from the building. The old log building is in good condition and shows interest by owners with patches and repairs via corrugated roofing metal, AKA “roofin’ arn,” in LA (lower Arkansas parlance). There was a residence nearby but no one was home, so I am sadly lacking in information. There is another log structure adjacent to this one — which almost guarantees I will make a return trip to see if I can grab some information. There is normally a good story that goes with these old structures. 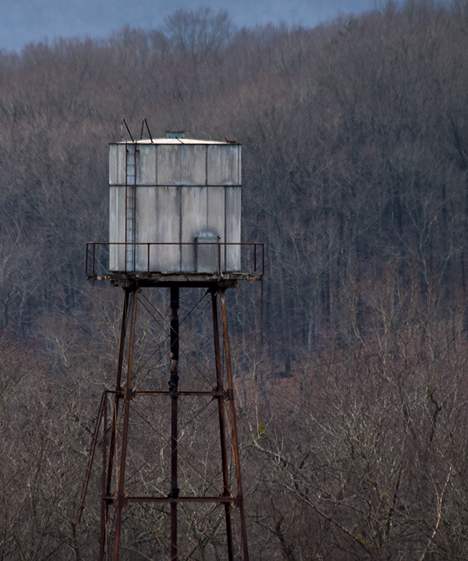 Water tower behind the shoe factory on Highway 270 East in Hot Springs. The day was overcast which facilitated the shot. On a clear day, it would be badly back lit. The old water tower has all the appearances of home and/or in-house engineering. It shows good longevity and lives behind the “shoe factory” on U.S. Highway 270 east of Hot Springs AR. I shot this picture with my long lens out the driver’s side window of the old faithful pickup (now about 263,000 miles), in the drive way of my client’s premises. The location is on a steep hill opposite the water tower, which affords the eye-level shot. It’s not every day you get a eye-level shot of a water tower. Parsley’s has long since bitten the dust. There are thousands like it. Once a cornerstone of communities, these stores succumbed to shifting economies and social trends. As the trip was winding down and I was back on a hard surface highway, I passed the former Parsley’s Grocery and Station showing signs of a lengthy retirement. Probably this condition did not come voluntarily. 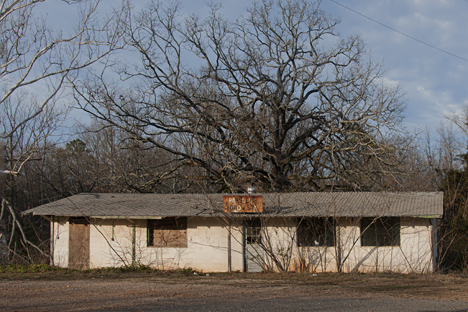 Thousands of empty community stores dot the rural American landscape. Most of them were social centers as well as a place to buy goods and services. Flagellating economic conditions, changing work patterns, communication innovations, and population shifts created a socio-economic-geographic whirlpool which sucked many of these community venues into oblivion. We enjoyed them while they lasted. See our pictures in a larger-format gallery. Check our our Weekly Grist gallery for all of this week’s pictures in a larger format. The old water tower is all that’s left of the former Pine Bluff Compress Company. Click on the tower to see our original February 2009 story and pictures. The old water tower is all that’s left standing of what was once the Pine Bluff Compress Company here in my home town of, you guessed it, Pine Bluff. Demolition of the site had already started when I did this shoot. Two years later the deed was done and the site is not flat except for the old tower. Take a look at our original post in 2009 which shows you the still standing and partially skeletal old compress building and an up close and personal look at the old boiler. The old boiler had the manufacturers name emblazoned on its doors. Turns out several people who saw the original post had fore bearers who worked at the old boiler company. The folks made comments on the article which are available at the bottom of the original post. You can see even more of the old compress and read additional information where our story started on the Photo of the Week page at Corndancer dot-com.